Rustenburg, South Africa - The Royal Bafokeng Stadium in Rustenburg provided a fitting venue for the hotly-anticipated clash between the so-called inventors of the game, England, and a USA side boasting a growing global reputation. Fans of the USA soccer team are often derided by supporters of nations that boast a richer history of competition; but though their team have yet to win a major trophy, the passion shown by their followers is up there with the best of them. Americans turned out en masse in all manner of costumes to represent for their team: from the man dressed as Captain America to the brave bare-chested chaps covered in face paint, the color and camaraderie was compelling. Not that England fans were completely lacking in creativity as notable examples, such as the fan who made a hat resplendent with vuvuzelas and another group who dressed up as the royal family, proved. The game itself didn't quite live up to the classic many in attendance had dressed up for however. England's early lead and optimism was soon replaced with worry and wayward passing as their resolute opponents refused to be perturbed from their task. Both sides had flashes in front of goal before Clint Dempsey's simple shot somehow, unbelievably found its way past the flummoxed England goalkeeper Robert Green. It was an horrendous error which the player will struggle to disassociate himself from, but in truth the final scoreline reflected the balance of play; Bob Bradley's men deserved their point. Both teams will still hope to qualify from the group but it is the world's best-paid coach Fabio Capello who has more head-scratching to do ahead of the next tie. His side, who many have tipped for big things in 2010, were off the pace and will need to improve to be serious contenders. Of course the point was deserved. Any point is deserved. There are no style points given in soccer. The only points given are for the ball breaking the plane at the front of the net. This was done twice. Once by the UK, and once by the USA. Who wants to compete at being best at being silly? Even when things are all good mooded going to a stadium in an ambience like described is a definite turn off. What is wrong with just being supportive. I.e. singing and cheering at given points when the team needs it or deserves it. Deepwater805 – actually it was done once by England and once by the USA. There is no UK football team. The UK weren't playing in this game. England were. Uk 'wasn't' and England 'was', rather. Shots on goal are very important in soccer. The more you put on goal, the higher probability that one or more will go in. England was lucky that one such shot was deflected by the goal post or they may be sitting with 0 points after their first game. Luck played a role for both teams in the game, not just the Americans. Kudos to goalkeeper Tim Howard for playing a splendid game. What the American team lacked in an effective defense, they made up for in sheer perseverance and passion. Hearty congratulations to the entire team and the USA. As for the enthusiastic supporters fortunate enough to be there to witness this prodigious event – thank you from all your compatriots around the world – we are there with you in World Cup spirit! Nkosi Sikelel' iAfrika!!! Agree with Deepwater805, any point is deserved but the game was between USA and England not the UK. Only in the US, people measure the passion of the fans by how the dress up in funny costumes. We don't have thundersticks or scream offense/defense during our games. We sing. It was a joy to hear the british sing their anthem... that is supporting, not vuvuzelas or dressing like the statue of liberty. us on CNN international. We love nothing more than to watch you eat your words. We've been doing that for well over 200 years now. Mulling over the game, I got the idea that the U.S. team had a spine whereas the English one only had muscles. Spine gives structure and facilitates the implementation of strategy. The English were like rebelling slaves throwing stones at the fortress. The U.S. has the psyche to be a future WC sooner than the English. It felt like England was playing better throughout the duration of the match. However, us stubborn Americans refused to give in and continued to play at 110%. "This was done twice. Once by the UK, and once by the USA." It's England not the UK! Scotland, Wales and Northern Ireland also have international teams. It's the main reason that team Great Britain doesn't play "soccer" in the Olympics, as people would then argue that if we can make one team for that why do we need 4 separate teams in other tournaments, that and of course the fact the team would be 95% English anyway! in the stadium EVERYONE wears orange clothes!! ugly , i should go and fan instead!! The UK doesn't have a soccer team. you've obviously not seen the dutch or the brazilian fans! I saw England-USA yesterday and i must say, USA played very well. Mature and steady with amazing goal keeping. Something that can't be said about "Green". "Team USA supporters among the best at fans' World Cup"
Good for you. Here's a cookie. Seriously, this is journalism? How about more reporting about the actual game and fewer attempts at "human interest". If it really really has to be a human interest story at least try to make it, you know, interesting. Christ, reading this report of the game was like reading an early edition of Pravda! The style in which CNN has reported on this 'soccer' match really highlights the gulf in both the understanding and regard you have for the beautiful game compared to the rest of the world. To report on a football match as ‘our fans won’ encapsulates the American psyche – the game was a ‘tie’ (you guys don’t do ties, do you?) and so you seek to win at something else, no matter how pointless. Ok. Ones and for all, its FOOTBALL, not soccer. No style points in soccer? Then all the faked injuries are just for show? Bravo USA! I would be glad if you'd meet Spain in the final of this South African World Cup 2010. Indeed it's great! Let’s be realistic people, we did not WIN, England goalkeeper did all the work for us! We will have to play much better than that to WIN FOR REAL! USA! USA! The US fans are sooooo much better than fans from some other countries! Yeah! No, really? Is it really necessary to boost the American ego with such "news"? Some national pride is good, but the US always seems to go over the top. Just enjoy the games and respect even those without fancy clothing. Maybe you don't have to paint your face to be good supporter of your team. Maybe. "Once by the UK, and once by the USA"
Oh Good Grief!!! The United Kingdom of Great Britain and Northern Ireland. The UK comprises four separate countries. England, Northern Ireland, Scotland and Wales. The team your country was playing last night was England. Any one team, from the other three countries, would have performed better, and with more cohesion, than that shower last night. Count yourselves lucky. I cheered for the USA over the last ten minutes. They didn`t deserve to lose the match. The USA outclassed us in the first half, were bettter applied tactically and far more intelligent than the morons who represent England. Intelligence deserved a draw with over-paid morons. Good luck for the rest of the World Cup, though I suspect both sets of players will meet up on the same day at the airport to go home way before the cup reaches the final. After all CNN IS an American corporation, hence this article. Please... Most Americans don't even know the rules to the game. Yesterday I even met an American who wasn't aware that the USA was competing in the World Cup this year. Just because a few Americans showed up dressed like the Statue of Liberty doesn't mean that they're "better" than any of the other fans. Wait till you see the Dutch on monday. Or look at the European championships in Bern in 2008. Well, maybe because its in Africa there wont be much orange. But streets here are all decorated orange etc. U.S team was marvelous taking on tough England team, never gave up. Howard, the goalkeeper was the best of the best. Is there a mistake in the headline? 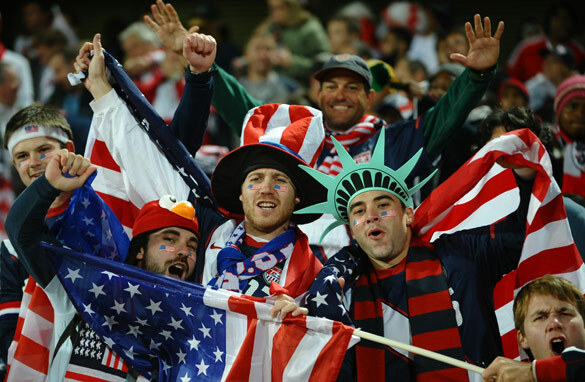 8 matches and you proclaim USA the best fans 'coz they wore some silly hats? Have you seen Argentinian supporters? South African? Brazilian? I am actually having some sympathies with many Americans now, who feel Soccer is being force feed down their throats, with all the useless over the top publicity for all small little things this WC. We're ENGLAND not the UK you idiot. Yes, we like the american fans and your team are likeable too, good luck to them. Incidentally, we can't help if we invented it or have a long history so get over that. (And yes, please stop calling us the UK or British, ta very much) Crack on with the next game then! Let’s be realistic people, we did not WIN ANYTHING, England goalkeeper did all the work for us! England were most likly to win, but USA are a resilent team. Same thing happen 4 year ago, when Italy drawed wth USA 1-1. I'm a England, but it's nice to see USA fans be so colourful at the statuim. I surprise aswell becuase soccer is that popular in the states but fans still showed. Anyway, well done England, hopefully you should get over your nerves and play better next time. And well done USA for being a tough cookie! I am in Boston and saw the number of people who came out to watch the match. It was incredible!! We really do care about this team, and to the person ("NoNo") who said that "Only in the US, people measure the passion of the fans by how the dress up in funny costumes. We don't have thundersticks or scream offense/defense during our games. We sing." and thats better than "dressing up as the statue of liberty" who the hell are you to judge the way another culture shows patriotism? That is the way we support our team. I am sorry that your team was embarrassed yesterday because the Americans actually played a semi-good game. The Dutch, the South Africans , the Spanish- all fans who show the most passion when it comes to showing their teams their support. Okay all American Soccer fans, let's get it right. The U.S. soccer team played the English soccer team. There is no "U.K" national soccer team in the WC. Please, please, please stop insulting Northern Ireland, Scotland and Wales! Good job the Us team ; it was very good to see the US team fight with all its faith. an eye from France . There still a lot of work to do for u. In this sport, Europe rules! plus, let's go to check how many gold medals we generally win in the olimpic games counting as the EU and not single nations..
its unfortunate most comments here are about who played (UK or england)The fact remains that Usa played well and got a deserved point. I cant say the same for england who has "world class players & invented the game". And wats wrong with the article? have you seen d commentaries by bbc on the match? May the best team win, not the most hyped. ). However, we do have a few home grown sports of our own which most of the world cannot say for itself. Most Americans prefer those sports. I'm proud to be from a country that possesses such innovation. This article is obviously written by an American. It hints (not so subtlely) favoritism towards the American team. But I won´t complain the fans were top noch. Cheers from Brasil. I watched the match with a bunch of Brazilians and they pulled for USA. Don't ask me why. But I couldn't help but shout "goal" out loud with them, when US scored!! Way to go USA!!! Parabens!! since when is england the "inventors of the game"? soccer comes from the maya game of pok-a-tok. usa may have great fans , but its team is one of the worst in this w.c.
they were hardly able to complete any pass in the second half. While the english were not playing well at all. I don't think the american team will survive the group fase! Regardless, my opinion is that luck was behind the American 'win' (haha) and not skill. Anybody who actually watched the match itself (and not the quality of USA's kazoos and hats, like this article ironically celebrates) would be able to see that it was just a lucky game for USA and a bad day for the England players. Playing like that, neither team has a hope of winning the ultimate prize, but at least the England team has a fighting chance if they keep their game up. The United Kingdom = Scotland, England, Wales, N. Ireland. I could be rude and suggest that the US team should be called California, but there are a few guys from other southern States on the team and a handful of guys who grew up outside of the american football, "Friday Night Lights" zone up north as well. Also, you have to admit Americans are getting better and better at soccer, so a little CNN over-analysis of the fan base is just part of the trend towards, "Hey guys, mind if we play, too?". USA might not win the cup or whatever but the "National Game" of so called england by their team was pathetic....has been pathetic and will always be pathetic.when did they win world cup the last time?1966 Ha Ha Ha... but seriously,why are they such bad losers always?the so called england will NOT win this world cup.Period. Please stop calling it "soccer" it is FOOTBALL !!! US fans all they care is fries and coke. They are bunch of idiot creatures. Wait until there is a real team to play. I mean for the USA to play. English hope and pray and pretend we will win as we last did, um, a very long time ago, but in our hearts we know we will lose. Especially if there are penalties. And yes the team is England not UK but it has ben said too many times now. I'm supporting England, but USA played well. It was good to see their fans out in their numbers, considering football(soccer) does not have a large following over there. So what if their chants and costumes were loud and excessive? It adds to the spirit of the game. They played with heart, are not intimidated by the 'powers' in the game, and their fans are among some of the best behaved in the game. They should be proud of their display yesterday, both on and off the pitch. I like the way it was suggested in various media outlets that Robert Green had 'redeemed' himself with his near-post save from Jozy Altidore in the 2nd half. Green flapped at it, turned it onto the post and was incredibly lucky that it didn't go in. Green himself will know just how fortunate he was. Capello has to turn to James or Hart now. Probably James, as the lack of experience thing (Milner as well) is proving to be a problem. Inspite of Capello, England demonstrated one more time they can not change theyr tactic. Since 100 years itr has always been the same, predictable and desperate "vintage". England has not a chance on one zillion to defeat teams like Brasil, Italy, Spain... My compliments to USA that, despite of theyr skill limits, played a good match. For sure they have great physical dotes. OK. Surely everyone has now agreed that it was England playing in this match. May I remind you that just as the UK does not have a team, neither does America! The United States of America (USA) tied with England. Remember, America stretches from Canada to Chile/Argentina – so there are actually 8 American teams in this tournament. sad but you guy do realize that here in America we don't care if it was the UK or England Or Great Britain or Scotland we didn't lose besides that who cares... Did you know England's has the highest paid coach 18 times what the American coach gets paid and you still cant beat us All we care about now is the next team we need to beat. England were unconvincing showing weakness in several areas including midfield and defense. And Rooney was totally ineffective. So I can't see why the entire US press is headlining the result as: 'USA gets a point due to Green's blunder', instead of giving credit to the US team. I mean its wasn't like the english dominated play or that the US wilted under pressure!? Nicolas, England didn't invent football, they codified association football. Which is the game being played in the World Cup. It's similar to Americans claiming they invented Baseball, they didn't invent it, they merely introduced the rules by which it's played today. A bit sycophantic with the reporting, self-praise is no recommendation as they say. But I've been impressed with the US and their attitude to this World Cup. Nice to see them getting onboard instead of deriding the sport for a change. If they bring the form they show when competing in the Americas into their final 2 group games they have a great chance of going through. No-one is at the World Cup doesn't deserve to be there (except France – guess which country I come from...). England played better in the game but probably not enough to deserve the win. Still all to play for and as always, may the best teams qualify! The USA did a respectable job against ENGLAND. I was watching by myself as I am the only soccer fan in the house. It was a bit sloppy playing on both sides in the first half but both teams stepped up their pace in the second half. I am proud of our team and look forward to the next game! Part of the fun of the WC is to show your support for your team how ever you want! Besides how many times have the English fans turned a great atfernoon into a blood bath when they start rioting! You never hear of USA soccer hooligans! Absolutely, everywhere we go we see more USA fans than any others. SA appreciates your support and we will be wishing you continued success. A goal is a goal. The bottom line is that England didnt get out of this one with 3 points, they just got 1 – period. The Americans, call them lucky or call them 11 men who played great soccer, walked away with a point too. Another draw against either Algeria or Slovenia, and a win over the other country, and they might just see themselves in the round of 16. While I dont see them topping the group, a second spot finish will probably see them meet the Germans in the round of 16 (fancy that). It stated in the article, the US had yet to win a major tournament... I thought the US won the world cup in 1950? Not bad for a country, where football (soccer) is not a main sport. As someone whose life is focused around the study of languages, I'm really tired of the "It's not 'soccer'; it's football!!" diatribe. (1) 'Soccer' wasn't made up to cheese you off; it's essentially short for 'association football'. "1889, socca, later socker (1891), soccer (1895), originally university slang (with jocular formation -er; see -er (3)), from a shortened form of Assoc., abbreviation of association in Football Association (as opposed to Rugby football) [...]"
Shall I run around hyper correcting anyone, proclaiming "It's not 'football'; it's 'association football!!"? No, because that would be pompous of me. (2) Although I suspect we're the most famous (and probably most harrassed) for it, Americans aren't the only ones who use the term 'soccer'. Nor are we the only ones to play and enjoy other codes of football. (3) Regarding association football: "Today the sport is generally known simply as football in English-speaking countries in which it is the most popular football code. In countries where other codes are more popular, the sport is more commonly referred to as soccer." Regardless of its origins, the average U.S. citizen didn't -pick- American football; they were raised on it. The simple fact of the matter is that American football exists, it is -a- code of football (you can decide for yourselves which one's -the- code of football), and it's popular. It has to be called something. 'Soccer' is a perfectly legitimate reference for Association Football. Furthermore, there is no equally convenient term for 'American football'. Were U.S. citizens to call soccer 'football', what do you propose they call American football (their football code of choice)? 'American Football' is almost as much of a mouthful as 'Association Football', and it would sound ridiculous anyway. If you come from the place where something is invented or famous or just 'the usual', you don't generally append your nationality unless it's a matter of branding (e.g. Champagne). Ultimately, it amounts to a cultural and dialectical difference. I would no more insist people stop calling it 'soccer' than I would run around yelling "It's not 'futbol'; it's 'football'!!". Assoc. football is -the- most popular sport in the world; there's no denying that. There's no need to feel threatened, nor to prop your ego with such a petty argument. Simply put, England couldn't beat USA, period. I can assure you KDD that the USA did not win the FIFA World Cup1950 or at any other time for that matter. Uruguay did win the 1950 world cup however. Team USA did a good job against a high quality team like England and deserve praise. The U.S has a large population to select from and an excellent infrastructure of sports training and education facilities. In 10 years USA will be a force to be reckoned with as they are in many international sports. Hopefully both England and USA will advance through the tournament and put on a great show for us fans. The annulled third USA goal in today’s game with Slovenia was painful to watch. I wish FIFA would adopt play analysis similar to that used in American football....in this case the game clock is stopped when there is doubt about a play, and all referees evaluate the video playback via various visual angles, then, with accurate information, they vote and make a fair and informed decision on the play. Its time for FIFA to adopt the technology available to improve the game we all love so much. finally it is just a football .